Travel up to the north of County Cork, into the high country which is still not quite part of the Kingdom of Kerry: make your way to the windings of the youthful River Lee just before it rises in the fastness of the Shehy Mountains, and you will find yourself in a magical place. You are in Múscraí (West Muskerry), one of the Gaeltacht districts of Ireland – areas where Irish is still spoken as the predominant native language. These districts were first defined when the Irish Free State was set up as part of the new government’s policy to restore the Irish language. Finola will confirm that everyone who grows up and is educated in Ireland today studies Irish in school. Sadly, the maps below show how native Irish speakers have declined since an Ghaeltacht was set up in 1926, partly through migration but mainly because of the predominance of the English language in public life. 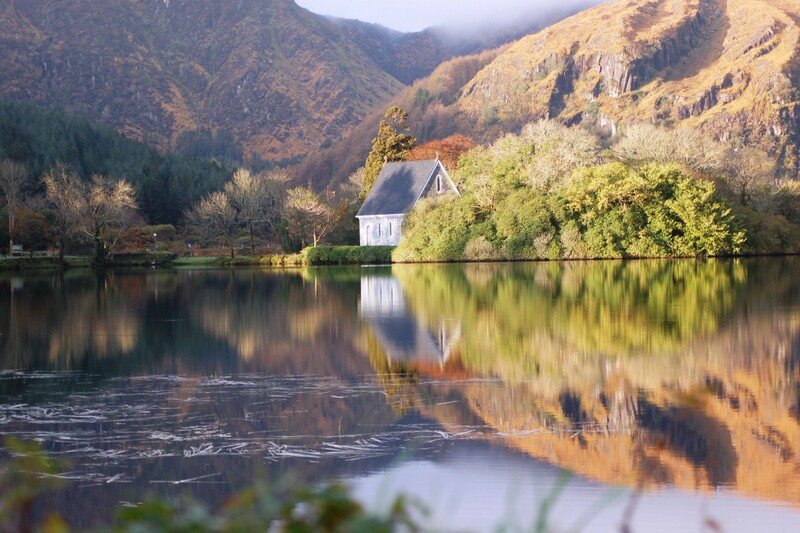 Our journey today takes us to Gougane Barra, a historical site where in the sixth century Saint Finbarr set up a collection of cells for his monastic community on a lake island in the mountains. Nowadays it is a centre for pilgrims and tourists. I was sent to Gougane Barra many years ago on the instruction of a client and friend, Father Sam Philpott, who had commissioned my architectural practice in the UK to reorder a church in the centre of Plymouth. 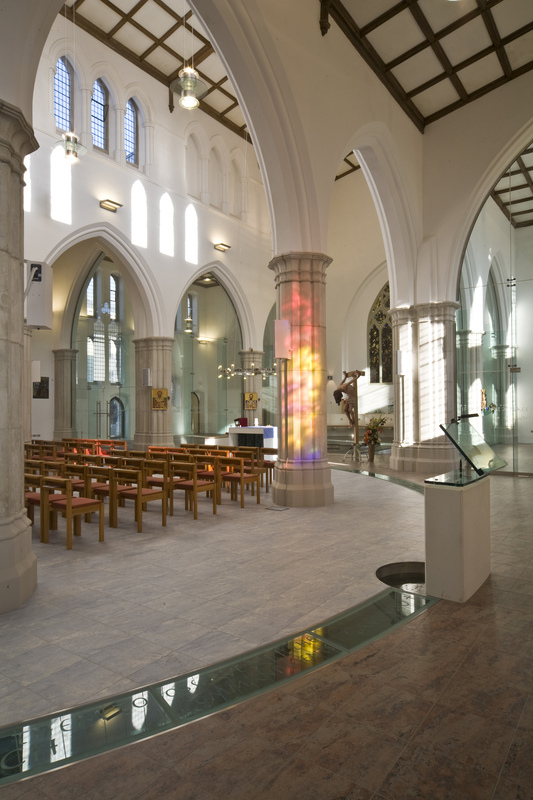 The place proved an inspiration to me – as he had hoped – and the renewed St Peter’s now has a rill of water running around the worship area echoing the water surrounding Finbarr’s community in the mountains: a piece of West Cork in West Devon! 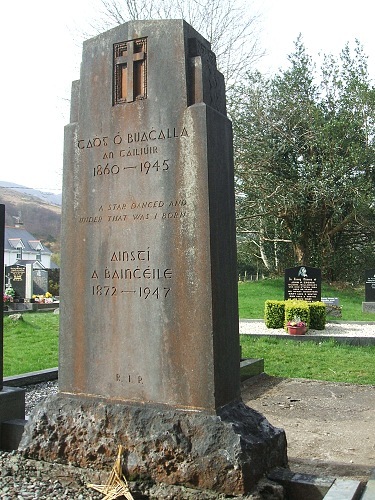 Gougane Barra was also the home of The Tailor and Ansty – immortalised in a book of that name first published in 1942 and written by Eric Cross, a journalist from Newry who lived in the locality for many years and visited the couple on a daily basis. ‘The Tailor’ (Tim Buckley) was a storyteller: not a Shanacai who travelled around the country seeking hospitality, as he had a paralysed leg since his youth and could only walk with the aid of a crutch, but someone to whom the world came and sat with while he ‘minded the dairy herd’ (a single black cow) or ‘reddened his pipe’ while perched on an old butter box (which he called Cornucopia) beside the kitchen fire of an evening, and listened to his tales and his homespun philosophy. He and his wife Anastasia were both fluent Irish speakers, and perhaps the book loses something for being written in English. However, it is a goldmine for folklorists or students of Finola’s Cork Speak lessons, because of the expressions which The Tailor uses: Thon amon dieul – (T-anam an diabhal – your soul to the devil), Yerra, man alive and (my own favourite) Thamwirrashimfaina being just a small selection. 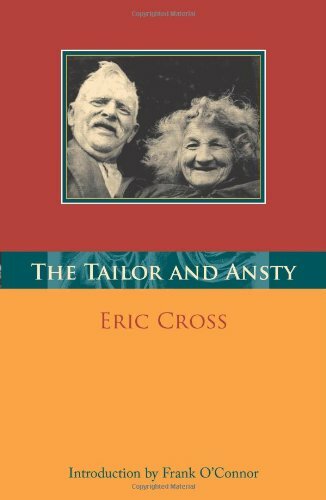 …’In the townland of Garrynapeaka, in the district of Inchigeela, in the parish of Iveleary, in the barony of West Muskerry, in the county of Cork, in the province of Munster’ – as he magniloquently styles his address, lives the Tailor. His small whitewashed cottage, with its acre of ground, stands at the brow of a hill, at the side of a road which winds and climbs into a deep glen of the mountains bordering Cork and Kerry. In the summer you will usually find the Tailor himself leaning up against the bank of the road, minding his one black cow. As you pass up the hill he will have watched you come and sized you up in his shrewd and kindly way. As he stands talking to you, helping you, pointing out this and that to you, you will scarcely believe that he has seventy-seven years put over him. The vigour of his body, in spite of the handicap of his crutch, the firm tones of his voice, the smile of his lively eyes, the thick head of silver hair, all belie the fact of the years. He will most likely invite you inside for a glass of buttermilk or a heat of the tea. Go with him. Let the beauties of Ireland wait. They will still be there when he has gone. Be, as he is, prodigal of time, and sit and listen to him. Forget the rest of your journey as the Tailor forgets the cow. Humanity matters more than either cattle or scenery. You have met a man – finished. The book was published in 1942, when the Tailor was 83. He lived only two years longer. He was proud of the book – and of his celebrity: scholars, folklorists and writers flocked to his fireside to meet him and to hear his stories, his proclamations and his banter with the long-suffering Ansty. The situation led to a debate in the Senate which lasted four days! Only one public man – Sir John Keane – defended the book. He quoted sections from it and these quotations were struck from the public record ‘…in case they should lead to immorality of the nation…’ The motion was lost by 34 – 2, and the couple were ostracised within their own community. This entry was posted in Folklore, Gougane Barra, Irish History, Religion, Roaringwater Bay and tagged A Star Danced, Banned Book, Eric Cross, Frank O'Connor, Gaeltacht, Gaeltacht Areas, Irish Censorship, Seamus Murphy Headstone, Seamus Murphy Sculptor, St Peter's Plymouth, Tailor, The Tailor and Ansty, West Muskerry. Bookmark the permalink. Wonderful to see ‘your’ church! And what a story – I obviously need to read the book. The play is often performed at Gougane in the summer. And Seamus Murphy’s son is an occasional resident of kilcrohane – links all over the place! Your description of the book is perfect and I do go back to it myself to re-read a true classic! Thank you, Sean. Another classic, of course, is ‘Stone Mad’ – about the sculptor Seamus Murphy.